I have decided to do this blog because I wish to share some of my many wonderful experiences with you all. The reason being, that some of you may have had similar experiences and can relate to this. Also there maybe something that I mention here that may help others on their own spiritual journey on the path to enlightenment. To write about all my experiences, I would need to write a book which some have suggested I should do. One of the rituals that I do daily is the Ritual Of The Pentagram (Banishing) I find this ritual very important as it helps clear away all the negative energies in the air that may have build up from both the astral and the elemental realms. I have seen a lot of people using this ritual for the first time expecting it to work just like that. If this is your expectation, then it is not going to work for you. Like anything new, it takes lots of practicing to get there. Not only this but you should first know all about the Archangels mentioned within this ritual, the elemental forces of nature. What the Words Of Power that should be vibrated right, mean in the ritual and things like this, and this go`s for all the exercises I talk about here. Another exercise I do daily is a exercise that balances out the energies within myself. This exercise is called The Middle Pillar Exercise. Another thing it does is change the frequencies around me in the room due to the Words Of Power I use for each of the points of The Middle Pillar Exercise. When this takes place it attracts certain spiritual beings to come around me as I go through the day because of the vibrations. I also like to spend a lot of time in prayer and every now and then, fasting, depending on what spiritual work I may be doing at the time. 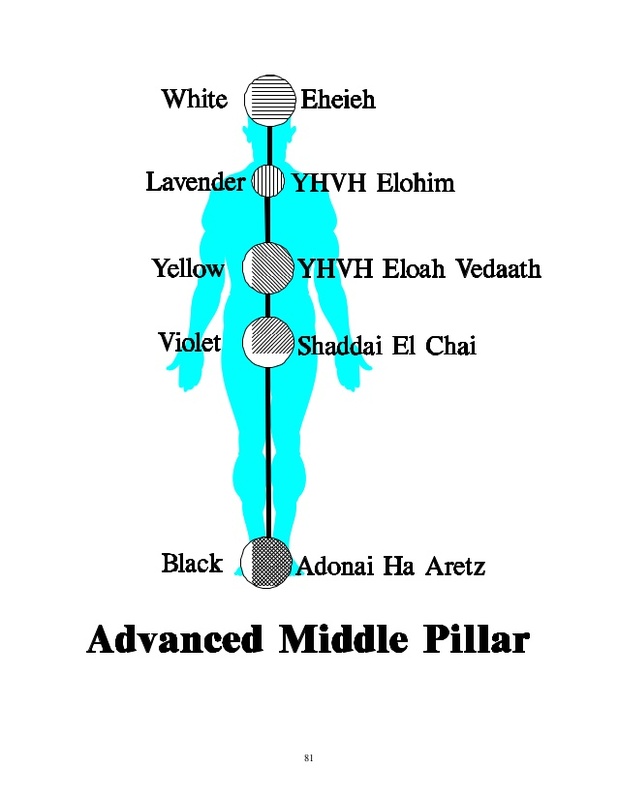 Another ritual I do daily is the Kabbalistic Cross Ritual which clears my Aura or Sphere Of Sensation as I call it. It also helps strengthen the Sphere Of Sensation, but at the same time helps to make it more sensitive to the energy vibrations around me. I have tried many methods and esoteric techniques in my time and will continue to do so, as we should never stop learning. If you ever get to a point where you feel that there is nothing more to learn or you just do not wish to learn anything more spiritually. Or maybe you feel that there is nothing someone else could teach you, then you are making a big mistake and it does not matter how many years you have been studying and or practicing the spiritual disciplines. The methods I share with you here work or at least they work for me and very well, this is why I choose to share them with you. The spiritual things I talk about are not what I have just read out of a book, but what I practice on a regular bases. I notice some authors in which I will not mention any names, have sentences like for example, "It is written" or "It Is Believed" when talking about spiritual techniques, yet they claim to be an authority on it. This makes me wonder if they have even practiced the method and if they have, if they have ever experienced anything from it. These basic rituals that I practice daily help my day run a lot smoother, claimer and the results can clearly be seen. Another thing I love doing is meditating every day and for me the shortest meditation is around one hour. The different levels of consciousness and realities that can be reached through meditation can only be seen by me as amazing to say the least. The benefits of doing this on a daily bases are very rewarding in deed. There have been times where I have not wished to come back out of the meditation. Sometimes I go a little to deep than I should do on my own, as it is a good idea to have someone with you that knows how to bring you back if needs be. I remember when I did my first meditation and I thought to myself "I don`t feel anything at all". Then after continued go`s at doing it and trying different meditations, things started to change, firstly from within myself. I was starting to feel more claim, the negative thoughts and worries where fading away. I was feeling way more relaxed and I felt like I had, had a good sleep and was energized once more. These days along with what I have just talked about, I am able to leave my body and look back at where I am sitting on the chair, watching it as an observer. I am also able to walk around the house and fly through the air and travel places. Sometimes while I am under meditation, I am able to think of a place and I am there, just like that. To me, I would imagine this is what it would be like for those that have just crossed over. In a way it is a lot like what these spirits would be experiencing as I myself are traveling in the astral realm. Another ability I have learn`t through meditation, is to see around the house with my eyes shut. Now I do not even have to meditate, I just can close my eyes and see clearly, much like a photographic memory I guess. I am able to see the spiritual beings and other inter-dimensional beings with me in the house through this ability. This ability is called being able to "See In The Spirit". About a week ago, to share with you an experience. I was in meditation and I saw two Angels around me. They where standing over me, with there hands on my head, doing something to my body. I could see them clearly and felt them with my Sphere Of Sensation. When the meditation finish, I felt like I was on top of the world and I was full of energy, recharged once more to go on with my day. It is very hard to explain this, it was like I had a heightened sense of great joy coming from within me. This same sensation has happened to me many times when doing a ceremony and I have called down the Divine energy and light into my body. I am also able to look into a symbol, for example the alchemical symbol for Water, which is the Blue triangle pointing down. One of the triangles of the Hexagram, the other being the alchemical symbol for Fire, the Red triangle pointing up. 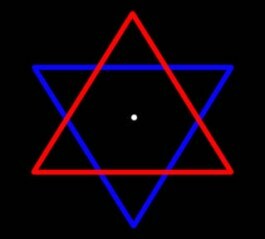 It is interesting, as the main Instrumental Trans-Dimensional Communication method I use is Rapid Moving Water and Direct Sunlight (Fire) Reflection, Fire and Water, the two triangles that make up the Hexagram. There is another thing that I can add to this also, in Genesis of The Bible chapter one. Well, it talks about the spirit of God moving upon the Face of the water, think about that. It means that God`s spirit could be seen as a reflection on the surface of the waters. There it is right there in the first chapter of the Bible and if God`s spirit could be seen as a reflection on the surface of the water, then so could the spirits of others. I know I am getting a little off track here, but that is just a little revelation that came to me very recently from those in spirit that I wished to share with you all. Anyway, back to what I was talking about once more, if I focus deeply on the symbol I am able to go within the element of water, using the symbol as a gateway to pass into it. Once I pass through into it, I am met with many different spiritual beings and beings from other dimensions. However, all the beings I meet have some connection with the element i`m working with. I am then able to communicate with them if it is there wish to do so. Mind you, this is not the only way I communicate with the spirit world, as there is many. 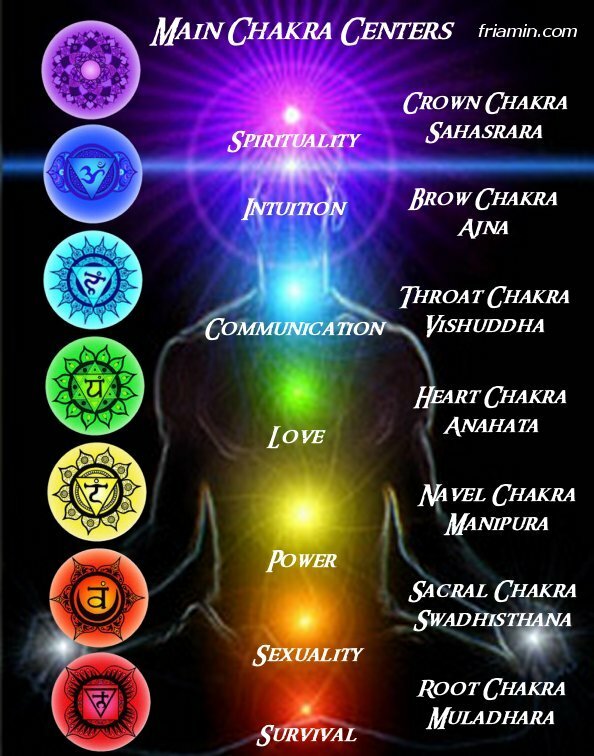 I also do other meditations as well, for example, Chakra/Kundilini/Third Eye work. One thing I wish to tell you about an open Third Eye which I have achieved at my Crown Chakra/Pinel Gland. The experiences I receive from an opened Third Eye are like images and pictures flashing before me within my mind, a vision. They are always out of the blue and are not related to what I may have been thinking about. They are always very clear and are of great detail, I see them much like dreams. The images and pictures are messages in symbolic form and so I analysis them much like I do with my dreams. I then write the message down in my dairy as I do with all my spiritual work and also the experiences that came through doing it. 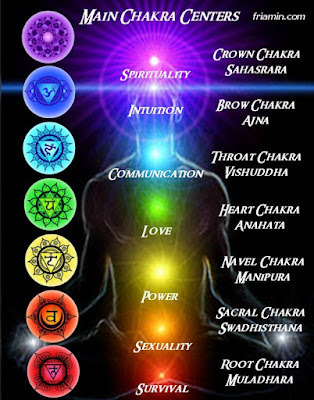 One thing I wish to tell you, is that you will find many video`s and lectures from those that think they know and connect the Middle Pillar Exercise points in with the Chakra points. These points are not the same and can not be put together, they are completely different systems altogether. 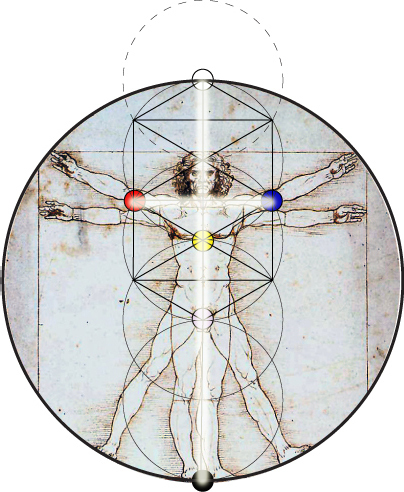 The main Charkra points go from the base of the spine up and work with the physical bodies energy. 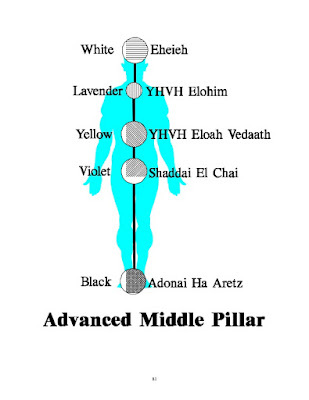 The Middle Pillar Exercise points start from just above the head, the Divine Light (Kether), and work their way downwards to the last one near the feet (Earth/Malkuth), they work with the Astral Body. Any questions in regards to this blog, please let me know at the bottom of this writing thank you.